more stuff in my booth! It was in need of some freshening, so I spent about 2 hours today moving things around and making it look better. It looked ok before, I just wasn't super proud of it. In my rush to get things set up in December, I didn't have a lot of time to think of how I wanted "The Look". I added in some vintage sheet music to the top shelf. Last week I had the lonely copper breadbox sitting up there, and it looked pretty corny. I also made a real sign for my spot! 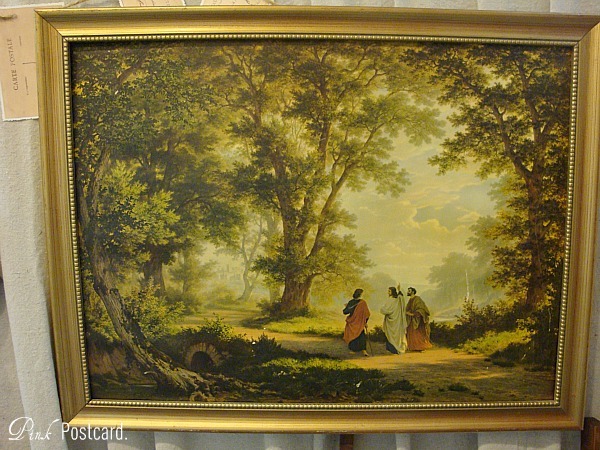 Remember the oval gold frame and 1970's painting that came with it? Now it looks like this! I grouped more like items together. This vintage window screen and dotted lace scarf was something I added in today too. Kinda separates my booth from the one behind mine. I desperately need to find / make some bookshelves!!!! It would be so much better for some of my smalls. *sigh* That's on my wish list. 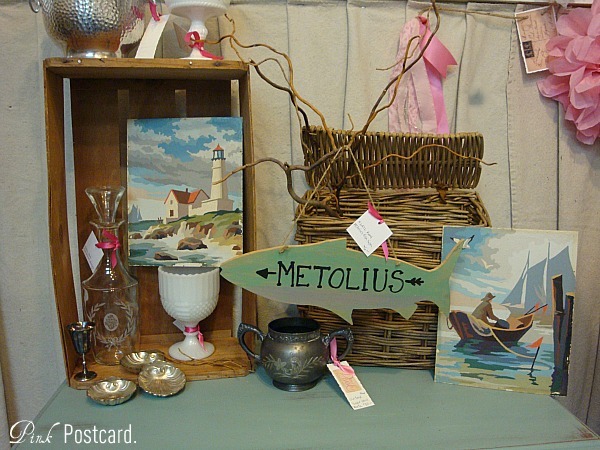 New items here include the vintage sea life paint by numbers; the Metolius fish sign (a famous fly fishing spot here in Oregon! Painted and cut by yours truly); also the tall lidded basket, which has little leather hinges! 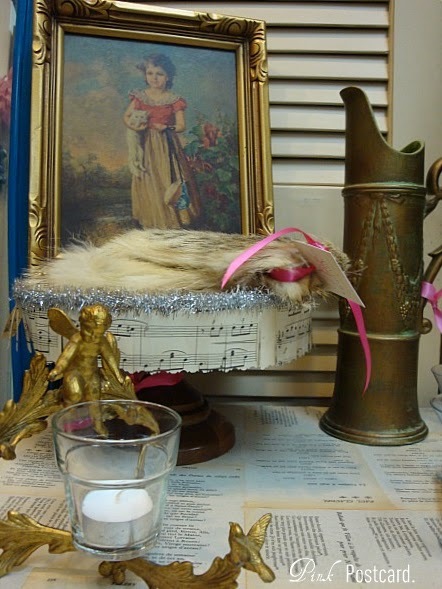 Some other new items in the booth- a vintage print of a girl with her cat, "Chums"; a pretty gold cupid votive holder; the wood footed stand with sheet music fringe; some mid century fur cuffs! These were actually my grandma's. I'm ok with letting them go. (so is my mom) I'm not really into fur these days- too much of an animal lover. They could be added to a coat, some boots, or maybe a sweater! The key is vintage, and I thought it was cute with the bit of red velvet backing! Probably the hardest piece for me to let go of was this vintage litho of Jesus and his disciples. Both Jon and I really loved it. I did hang it in our house for a few days before I decided to put it in here. It's really beautiful- I don't care for a lot of the art you find in Christian bookstores these days. If you look closely you can see that the path is leading them to a city beyond the trees, just to the left in the picture. Hope I don't regret letting go of this one too much!! It was fun getting the booth in order and some new items stocked. I have a few more pieces waiting in the wings, including some vintage Valentines. loved looking at your goodies on this little tour of your booth. 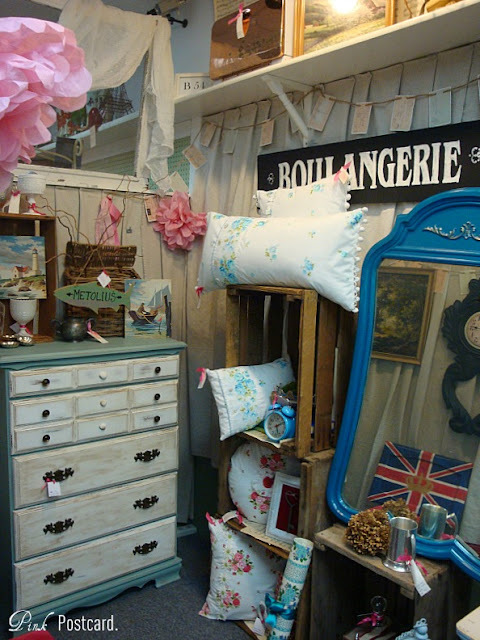 oh wow...your booth is great i have a booth too and your pillows have the vintage vibe i love! Glad you gave us this tour! Are these at Aunt Bee's? I think I need that key, and those pillows are TDF!! Here is what I do, if I have something I am struggling to sell or not to sell, I price it really high, if it sells, it was meant to be and if not....God wants you to keep it LOL!! Your booth looks great, love stacking for height! Yay! So fun to finally see your new booth space! It looks great! And it looks full! That's good! I agree with Carol, if you put a high price on something you love and aren't sure you want to part with, it is easier to let it go when you see all of the moolah you get to go buy something else with, and if it doesn't sell then it was meant to be yours! I just bought a fairly large vintage painting of the last supper! It's a paint by number done in really pretty pastel colors. I am planning to put it out around Easter time...unless I find a place in our home for it! Your litho is so lovely! I can see why it would be hard to part with! I'd love to make plans to meet up with you! Let's talk soon! Love the tour... my favorite thing is the large cloche!! I can never have too many! 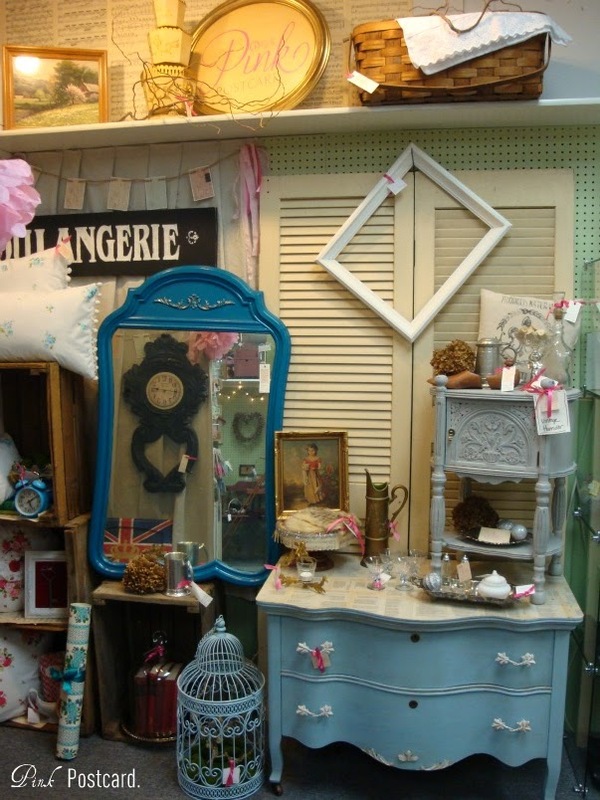 You are doing a wonderful job stocking and staging your booth! Your new sign gives it a professional touch. Great looking booth! 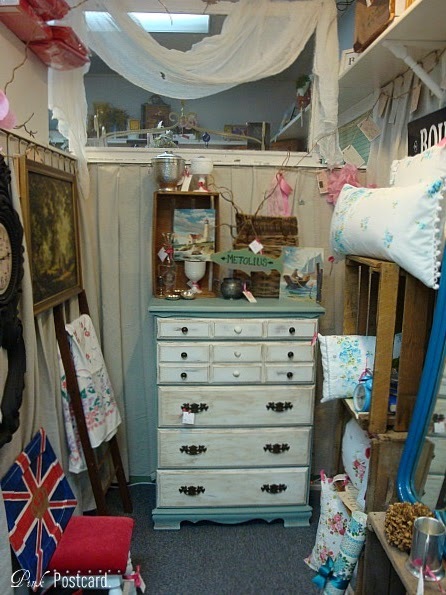 I just found you from French Country Cottage and I am your newest follower! Thanks for the inspirations! Your booth looks beautiful Denise, I love the way you set up and arrange things. Thanks for the tour of your booth! 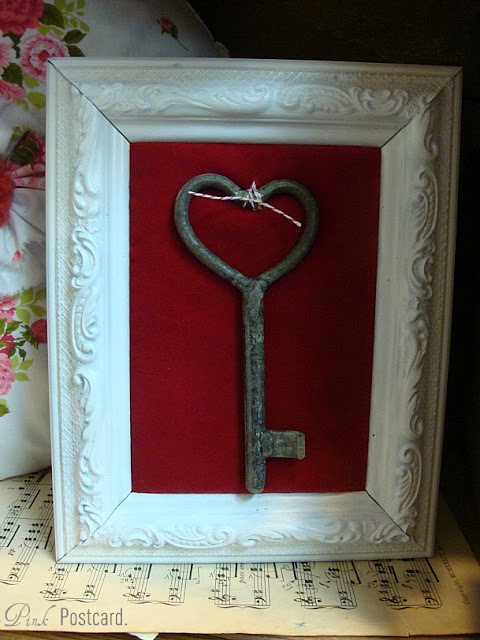 Love the framed 'key'!! 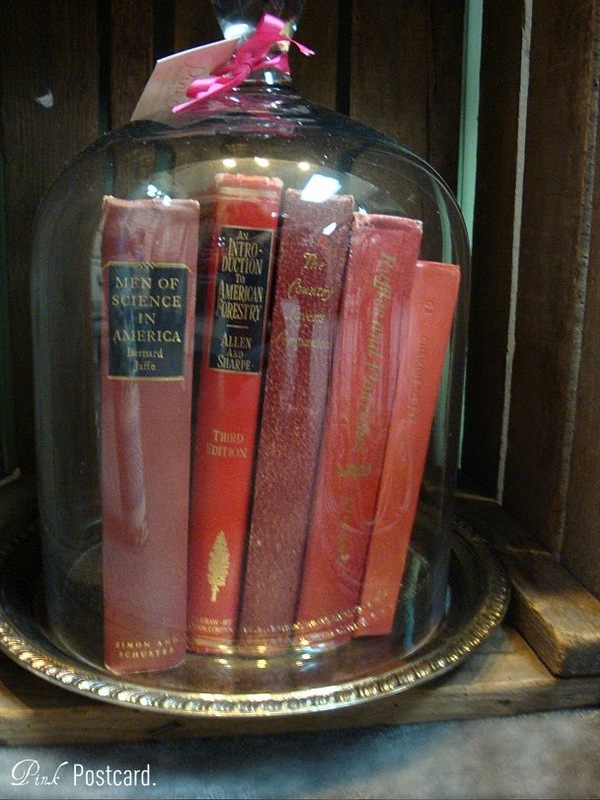 Loving the cloche with the distressed red books and the skeleton key with the red velvet and white frame!!!!! Such beautiful, romantic items.